The Beijing International Hotel by Chinese artist Cui Jie (Courtesy Cui Jie and mother’s tankstation, Dublin | London). 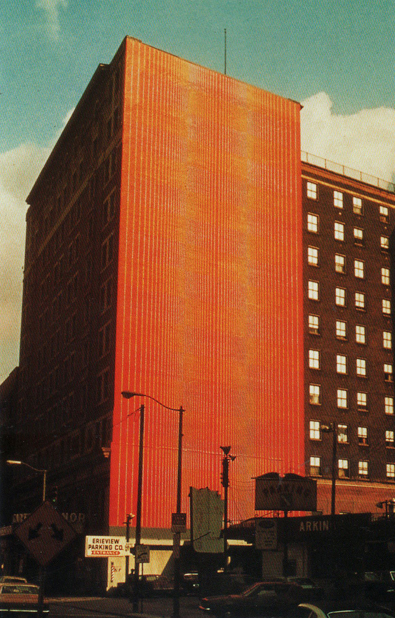 The original mural by Julian Stanczak, Carter Manor, 1973 (Courtesy Julian Stanczak). The potentially most striking exhibition is Canvas City, a mural program across approximately nine downtown blocks that revives Cleveland’s 1973 City Canvases program and Julian Stanczak’s iconic mural. FRONT will restore Stanczak’s mural on its original twelve-story building on Prospect Avenue and Ninth Street. Over the next three years, more murals will be completed throughout the city by contemporary artists Odili Donald Odita, Sarah Morris, Heimo Zobernig, and Kay Rosen. “In the 1970s, the mural program was part of a blight remediation movement to help revitalize a very bleak condition,” said Bidwell. 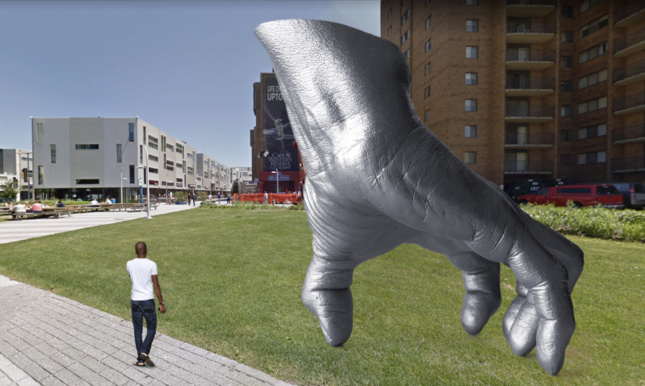 “Now, this is not a remediation, but a celebration and a way to enhance the city with new works by important artists and a tribute to Julian.” For this first triennial FRONT will create augmented reality versions of the proposed artworks. Cleveland Clinic, which is already home to a renowned art collection, is adding two new artworks, a wall painting by abstract artist Jan van der Ploeg and an installation by multimedia artist Sharon Lockhart. At Case Western Reserve University, FRONT artistic director Michelle Grabner and the university commissioned Chicago-based artist and sculptor Tony Tasset to create a pavilion for the 34,000-square-foot plaza at the university. The result, Judy’s Hand Pavilion, represents the hand of Tasset’s wife touching down on the earth. “It has this great interplay of masculine and feminine because it is clearly a woman’s hand, but also has these God-like references reminiscent of Michelangelo’s Creation of Adam,” Grabner said. The triennial expands beyond Cleveland into nearby northeast Ohio, including Akron and Oberlin. Oberlin College will also serve as a site for a few important architectural events. Conceptual artist Barbara Bloom will create a new installation in the Robert Venturi–designed wing of the Allen Memorial Art Museum by building architectural elements around the existing artwork. 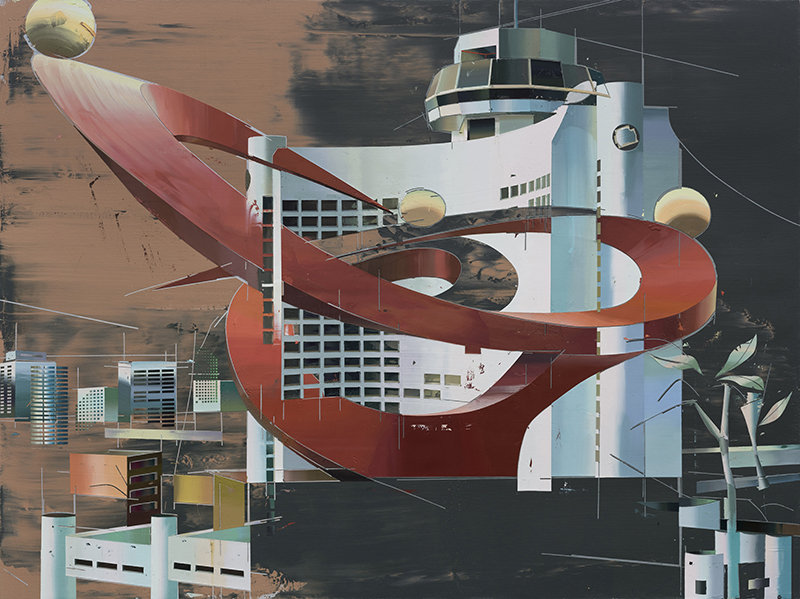 The museum will also feature Chinese artist Cui Jie’s futuristic city paintings that explore utopian/dystopian urban landscapes. To create these fantastical works, Jie combines the stories of Orson Wells with her perspective of Chinese cities, including Chinese propaganda and communist aesthetics. 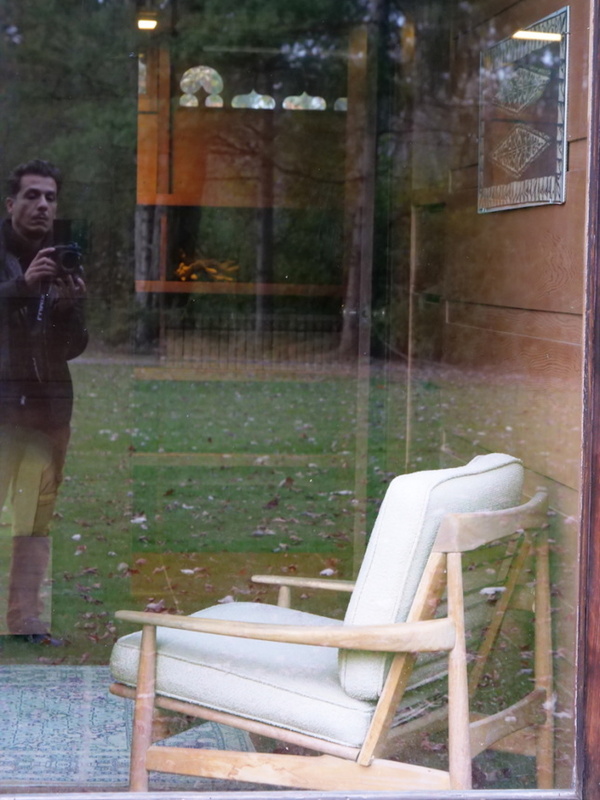 At Frank Lloyd Wright’s Weltzheimer/Johnson Usonian House—five minutes away from the museum—painter Juan Araujo will add a new series to the modernist art collection curated by art history professor Ellen Johnson, who lived in the house from 1968 to 1992. To learn more about FRONT Triennial and to stay updated on its programming, check out its website here.